Christmas has come and gone and, notwithstanding warnings of obese poultry, it was the time of year for various street parades. While the parades are intended to engender and express the Christmas spirit, the cynics among us say the parades serve to provide notice that the Yuletide duties of retail and dietary excess should be brought to the fore but they also present an opportunity for community and special interest groups to rally their troops, polish their straps and strut their stuff in front of the local populace. For the AMM this refers specifically to the Port, Norwood and Blackwood parades, in that order over the space of four weekends commencing one Saturday in mid-November, providing yet another opportunity for a dance and further feats (feets?) of endurance and coordination. 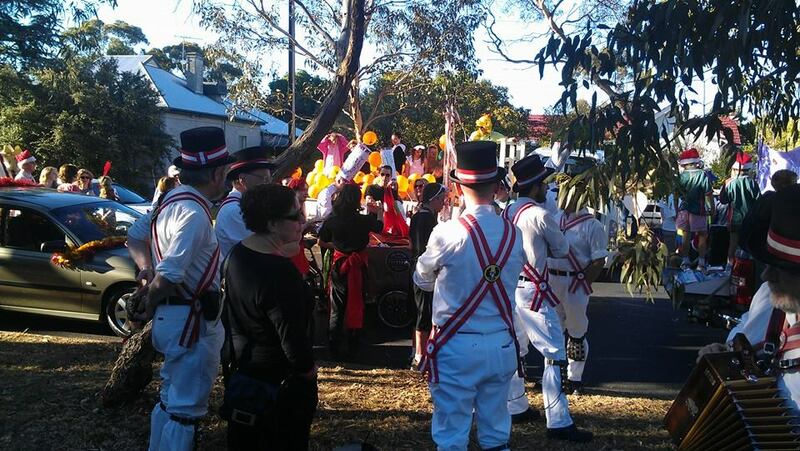 The hurry up and wait organisation of these local council affairs gives plenty of time to chat to other participants, look over the nearby floats and entrants, perform a few warm-up dances and finish off War and Peace before the parade swings into motion. Organisers are not always sympathetic to the separation required of a single accordion from the gentle ministrations of a Scots pipe band or amplified muzak and credit should be given for the art shown by our office bearers in positioning the side in the parade itself. Sometimes requiring a little informal adjustment en route, our parade position at any one time often seems an exercise in the Heisenberg Principle. Having given Winster a workout over the years we are now incorporating other processionals for more variety, perhaps to stave off the ‘dance-trance’ of the longer efforts. 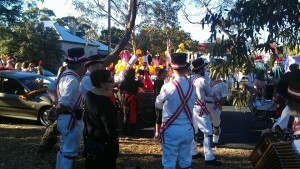 At Parade end we adjourn to the favoured local to dance and drink for the remainder of the day. This all constitutes good exposure for the Morris and always there is interest from both participants and spectators. This is one of our favourite gigs for a number of reasons. These include the heritage nature of the precinct, the size of attendance, the spectator recognition of the side due to the years of AMM involvement and the sheer number of local pubs nearby (including the opportunity for a glass of the ‘Archie’ at the Lighthouse). Being an evening parade there is less opportunity for post-parade dancing but the temperature is always right for what had become our longest processional. Originally the longest and surely the parade most anticipated by our resident masochists for its length and timing to the heat of the summer day, it has been shortened over the years but still remains the best turnout of the three. This year the South American dancers provided an area of particular ‘professional’ interest in the lead up. Unfortunately their attendant drummers required the greatest separation possible once underway, the accordion seeming so loud in practice succumbs readily to such an onslaught. In homage to the masochists, this year the parade regained its distinction as the longest (for us), its length almost doubled by the immediate return ‘upstream’, as it were, of the processing AMM from parade’s end back along the original route to the favoured local (Finn McCool’s) for our regular sets. Second time only for us, this evening parade needs a few years to build the quality of its entrants but matches the others in enthusiasm. A particular feature of this parade for us is processing directly into the setting sun, surely an exercise in trust as little ahead but the next man can be discerned, perhaps accounting for the new single file processional all the way. The parade went well but, due to population pressure, the fair at the parade’s end was a little chaotic. With this and poor dancing surfaces, the dances at the end of the trail were, while still enjoyable, not of our usual quality. But it was a good day and appropriately enough we rounded off our following meal at the Duck Inn with a bill. Nuff said.